using the second style in the columnClasses attribute, and so on. which works the same way that the columnClasses works for columns. Notice the <h:outputStylesheet> tag inside <h:head> near the top of the page. 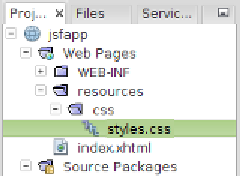 resources directory under the Web Pages folder. directory should be named css ). We place our CSS style sheet(s) in this subdirectory. shown. However, it is part of the code bundle for this chapter.